How does a peanut farmer become Governor of Georgia and President of the United States? Only in America could such a story be true. As a small child, Jimmy Carter set his sights on the United States Naval Academy. After graduation in 1946, he married Rosalynn Smith, and six years later, Carter followed the brilliant Captain Hyman G. Rickover into the uncharted waters of the Navy’s nuclear submarine program. When Carter left the Navy, he returned with his young family to the fields of the family farm in Plains, Georgia. Not satisfied with the climate of injustice he witnessed in his daily life, Carter sought a political career and was elected state senator in 1962 and again in 1964. He successfully won the 1970 campaign for Governor of Georgia. In 1975, Carter announced he would run for President. Under the new Federal Election Laws only $21.8 million would be provided for the General Election Campaign. A trivial amount compared to future campaigns. An army of loyal supporters, friends, neighbors, and elected officials, known as the Peanut Brigade, joined the campaign. They traveled across the country, joining Jimmy and Rosalynn, knocking on doors, standing at factory gates, walking streets, asking voters to vote for Jimmy Carter for President. 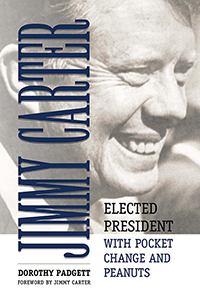 In 1976, Carter was elected the 39th President of the United States and served one term. Since leaving office, Carter has not stopped working on behalf of not just Americans, but for people worldwide. While the basics of his story are well known, they have never been told from the perspective of a “soldier” in the Peanut Brigade. Dorothy “Dot” Padgett, with an earthy, honest, and Southern voice, tells the story as if new to all of us. Humor and insight abound in this direct telling of how a peanut farmer from Georgia became President and leader of the United States. The secret is in his character, his morality, and in his being truly human. A great ride with Jimmy Carter and the Peanut Brigade from Plains to Annapolis to DC and back. A President's life of accomplishment, a lesson in tenacity, and an example of uncompromised personal standards.